We put together the top 10 most innovative and popular 3D printers to come out of CES 2018. This list is subjective and is based purely on our point of view and in no way guarantees the quality of the products. We just think that they are fantastic and that’s why we wanted to share them with you. Enjoy! The Eastman Kodak Company presented many innovations during CES 2018. Among them was the new plug-and-play desktop Kodak Portrait 3D Printer. The creators state that it’s “The new standard for professional 3D Printing”. The build size is 200 x 200 x 250 mm with the resolution yet to be revealed, but pre-orders are already available for $2799. Airwolf 3D presented a machine that shouldn’t be called a “3D printer”. 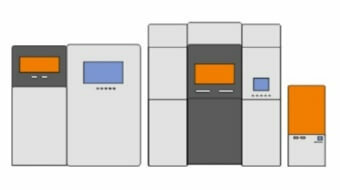 The developers claim that EVO is an additive manufacturing center that outperforms regular 3D printers in all aspects. For instance, it’s packed with such innovative features as PartSave™ and FailSafe™ that restore printing after interruptions (filament finished or power failures for example). The minimum layer thickness is 0.04 mm and the build size is 300 x 300 x 280 mm. The EVO AMC will be available for purchase starting from February 2018 for $6,995. 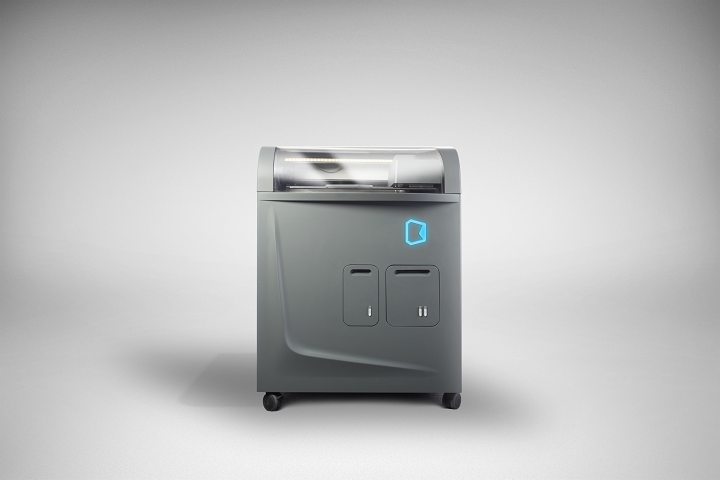 Ceramo One is a binder jetting 3D printer for clay-based powders that was made for manufacturing ceramic objects. This machine has a relatively high manufacturing speed (160 mm/sec) and accuracy (≈ 20 microns). Build volume is 350 x 350 x 380 mm. 7. Rize™ One by Rize Inc.
Rize™ One combines FDM technology and Piezo Jetting which the manufacturer claims help the machine produce parts with the highest isotropic strength (2x stronger than ABS-plus) and even stronger than polycarbonate and carbon fiber-reinforced parts in the Z-axis. Minimum layer thickness is 0.25 mm and the build size is 300 x 200 x 150 mm. The da Vinci Color is another incredible machine that combines two different technologies. By combining inkjet together with FFF technology, XYZprinting were able to create a full-color 3D printer where droplets of ink attach themselves to color-absorbing PLA filament. Minimum layer thickness is 0.1 mm, build size is 200 x 200 x 150 mm, and is on sale for $3,499. NXV has the potential to be one of the best resin 3D printers with an impressive precision of up to 30 microns. It uses self-lubricant sublayer photocuring that can 3D print up to 1 cm per minute (2700cc/hr). Build size is 180 x 140 x 200 mm and prices start from $19,950. XPRO S is a professional SLA 3D printer for large parts. Its build volume is 300 x 300 x 300 mm, the minimum layer thickness is 0.01 mm. The manufacturer claims that this machine has a choice of various materials for multi-purpose usage. Dobot Magician is a multifunctional robot arm that is capable of 3D printing, laser engraving, drawing and the list goes on. Minimum layer thickness is 0.1 mm and the build volume is 150 × 150 × 150 mm. The developers consider this machine a perfect tool for learning programming, data modeling, mechanical engineering, and much more. It’s no wonder that the Dobot Magician was selected as a CES 2018 Innovation Awards Honoree. The Halo by Ethereal Machines is a hybrid of a 3D printer and a 5-axis CNC machine. It’s said that this machine can “equip an entire spectrum ranging from the hobbyist to an industry with quick prototyping and manufacturing abilities.” The build volume is 150 x 150 x 150 mm and the accuracy is about 60 microns. It has multiple tool support, high accuracy mechanism, dedicated PC-based controller and other notable features that led to it winning the CES 2018 “Best of Innovation” award in the 3D printing category.